Thankfully I got about 4.5 hours of solid sleep last night. I really needed that. I could have slept longer, but as per usual with me, I was afraid I would oversleep the alarm clock. As a result I laid there awake for about 30 minutes or so before I just decided to go ahead and get up, get ready and hit the road. I guess I should have just stayed in bed because it was a morning of mistakes. It actually started last night when I put my laundry bag in the drain sink for my friends washing machine. Of course I had no idea about that until this morning when I went to fold my laundry and repack it. That’s a lovely thing to walk up to as your laundry dufflebag is soaked, along with everything still in its side pockets including your portable sat radio and other random electronics. To top that off, I guess I left this morning without my toiletries bag. Just lovely! I did hit the road, right around 4:30am. I had to scrap some ice on my windshield first and let the car defrost inside. That was unexpected, but then again, it was cold last night and this is the Detroit area and its just late April, should have expected it. The drive to the airport in Pittsburgh went quite smooth. I love being out on the open road like this, especially since I was feeling much better. I would dare say that I was back to my almost normal self. I have said for years, “I never feel more alive than when I am behind the wheel of a car, just driving out on the open road somewhere…” That is exactly how I was feeling this morning. 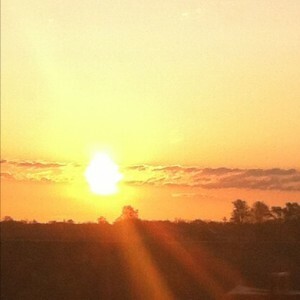 Got to experience a beautiful sunrise even. Life was good. I only stopped a couple times on the drive, once for gas and another to use the restroom and get me something for breakfast. I opted for a protein shake and bar. I figured I best eat something remotely healthy this morning, didn’t want a repeat of yesterday for sure. Thanks to only 2 quick stops, I got to the airport about an hour before Chuck & Lori were to land. This gave me time to drive around, make sure I had our route down to get us to PNC Park without delay and most important, top off the tank so when it came time to leave PNC I wouldn’t have to worry about gas on our way to Cleveland for the nightcap tonight. I was actually sitting at the gas station right near the airport when I got the call from Chuck saying that they just landed and to be outside in 15 minutes – 10-4 good buddy! Once I reacquired the “Maple Leaf” , the 3 of us were on our way to the game at PNC Park. As I drove, it’s about 20 miles from the airport, I got updated on Chuck’s road stories from his games in Detroit, Oakland and Tampa. When we got to the ballpark we quickly realized that Chuck was going to be having a serious case of deja vu as there were tons of school buses parked all around. In 2009 when he was here on his streak attempt, game # 1, it was “Kids Day” and thanks to his driver blewing it big time and he missed his flight to Detroit for game # 2. Day # 1 and he had already had to change his schedule thanks to something out of his control. That is just how it goes. However, this time he had the Big Dog driving for him, I wasn’t about to let him miss his game in Cleveland tonight. With a quick getaway in mind, we grabbed a parking spot close to the home plate entry and headed in. 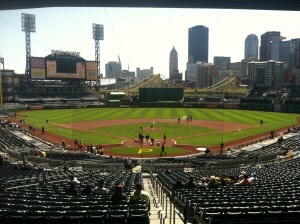 PNC Park has one of the best views, if not the best view, in all of the majors from behind home plate. It is often ranked as # 1 or close to it by people who have seen all 30 major league ballparks. I took a lot of heat from family when I said this after my first visit in 2003, but I just don’t get peoples fascination with PNC Park. Ok, so I get that it’s so much better than old Three Rivers Stadium, I really do even though I never made it to Three Rivers. However, from a fan perspective this ballpark is whacked! Where to start… hmm. Let’s see. How about the fact that when I walked in this time at the home plate gate (read: main entry to the ballpark) I came face to face with a big set of stairs to climb. Now, it’s not that I cant, but with my back and the brace on my leg, I prefer not to risk it. Knowing this, I asked an usher working there a simple question, “Where are your elevators located?” Pretty straight forward, yeah? Not to him. He looked at me as if I was from Nebraska or something! He asked me what I meant by that. That kinda confused me, honestly. I didn’t know what to say, so I asked the same question again. He then turned to another usher and asked him that same question and that guy replied, “We don’t have any.” Um, what? No elevators? How is that possible. As I questioned that, that 2nd usher walks over and says to the 1st one, “You’ve worked here 10 years, have you ever seen an elevator here?” I then asked them, “If I come wheeling up in a wheel chair, how am I supposed to get up to the main level?” To my shock and amazement they both pointed to the rather steep ramp that winds up to the main level. ARE YOU FREAKIN’ KIDDING ME?!? As I started to head towards the stairs one of the users yells out to me, “You might be able to get them to let you use the elevator at the suites entry, but I cant promise you they will.” I just shook my head and took my time on the walk up. Here is the thing though, it don’t get much better once you are up on the main level. If you want to walk around the entire ballpark you have to do so on different levels. As you make your way to the outfield area, you have to either go down stairs or an escalator. There may have been an elevator close by somewhere, I honestly stopped looking at this point. So, if you walk down the 3rd baseline from home, you have to go down 2 levels to get to the lower seats in the outfield. Same thing in reverse, if you happen to come in the center field gate, you have to go up 2 levels to get to the main level behind home. This makes absolutely no sense at all in any way shape or form! Beyond that, if you happen to get tickets to the bleachers, you may not be on the main level. No, you might be in the upper section and if you are, the *ONLY* way to get to them is, yes, you guessed it: STAIRS! Earlier today I tweeted this to everyone following me on Twitter : “It’s official!! 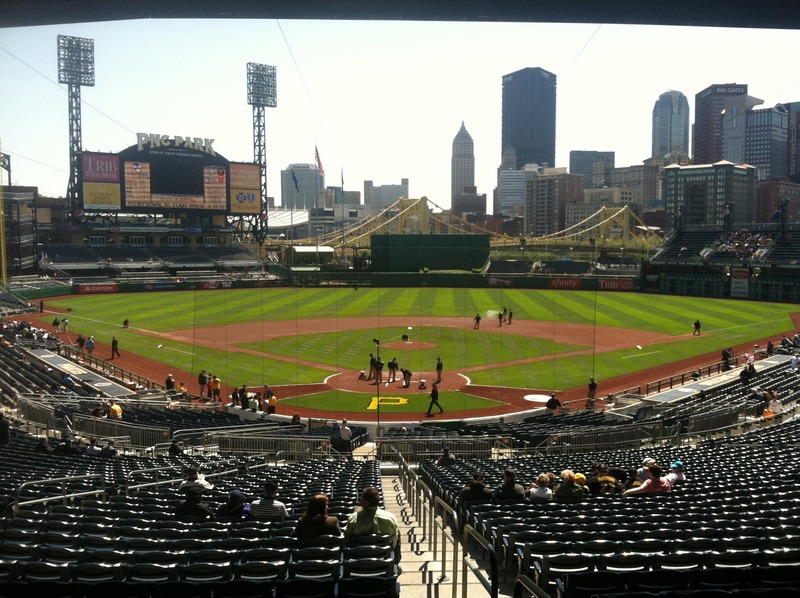 PNC Park is the most handicapped UNfriendly park in the majors.” I still maintain that the designers must have been stoned when they come up with the design for this place. Oh well, that’s just my opinion. Other than that, yeah it has a great view, the statues are really cool. The location right on the river is neat and all. Despite all the bad, I would still gladly take in a game here any chance I got. There is no doubt about that. Just before the game started Chuck & Lori met me at our seats in the bleachers (upper section) with drinks and a big ole pizza box. Chuck had been telling me about this pizza. Not that it was so great, but that it was a great deal. Gotta say that for $12 it was a very big pizza. The view from our seats wasn’t too bad at all. The weather was good, partly cloudy skies, but with a breeze that kept it a tad chilly until the sun really broke through and at that point my jacket had to come off because I got hot. The game itself was a pitchers duel into the 7th inning with James McDonald of the Pirates throwing a No-No through the 6th. He lost it in the 7th on a bad, bad, bad scoring call. What should have been an E5, went as a hit. Certainly no help from the hometown scorer there. He also gave up a run to the Rockies that inning, which brought smiles to our 3 faces, not because the Pirates were losing, but because there was finally a run on the board and someone was winning. See, extra innings is not a good thing when you are on a streak like Chuck. We needed a quick game so we could get to Cleveland for tonight’s game. As it was, the Pirates tied it in the B7th on Alvarez’s 3rd HR of the season that went out to RCF. At this point, I got up and started my slow walk around the park, up those 2 levels, to the home plate area. I wanted to be able to take my time, but leave in the plenty of time to be able to get to the car, swap my shoes/leg brace for my crocks and be ready for when Chuck & Lori come out running. 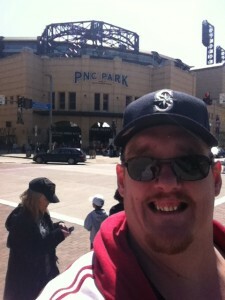 Here is a link to my pictures from PNC Park.